The police dispersed opponents of President Recep Tayyip Erdogan on Friday during a raid on the Zaman newspaper in Istanbul. ISTANBUL — Backed by a court order, the Turkish authorities moved on Friday to seize Zaman, the country’s most widely circulated newspaper, in the latest crackdown by the government of President Recep Tayyip Erdogan on freedom of the press. The seizing of the newspaper also highlighted the government’s building campaign against those it perceives to be its two greatest enemies: opposition journalists and the followers of Fethullah Gulen, a Muslim cleric affiliated with the newspaper who lives in exile in Pennsylvania. Mr. Gulen was once an ally of Mr. Erdogan’s but is now a bitter enemy. As news of the takeover became public Friday afternoon, supporters began gathering in front of the newspaper’s offices in Istanbul, and employees locked a door to the building. In a live-stream broadcast on the newspaper’s website, supporters were seen chanting, “Free press cannot be silenced.” Some carried Turkish flags and banners emblazoned with, “Do not touch my newspaper.” Columnists from the paper were also seen addressing the crowd. 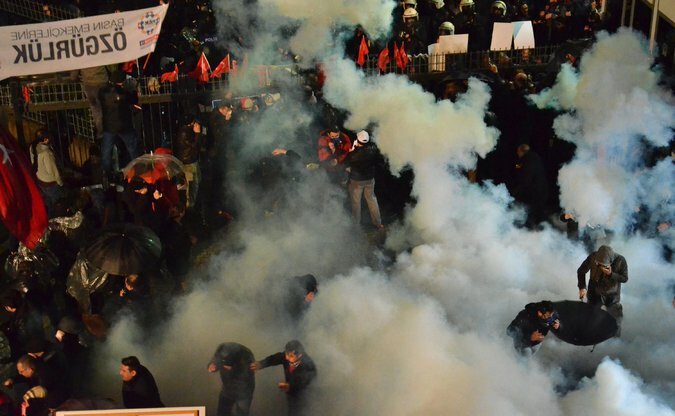 Later Friday night, Turkish police used tear gas and water cannon to disperse the crowd and forcibly enter the building. The move to seize Zaman and put it under the administration of a court-appointed panel of trustees emphasized what critics say is a rapid deterioration of free-speech rights under the Islamist government of Mr. Erdogan, who was prime minister for more than a decade before being elected president in 2014. The crackdown on expression comes amid a growing sense that Turkey, once seen as a bastion of stability in a hostile region, is being enveloped by instability. A war with Kurdish separatists has turned cities in the southeast into rubble. The country is straining under the weight of more than two million refugees from Syria. And Islamic State militants, who have used Turkey to transit fighters and weapons to Syria and Iraq, have carried out deadly attacks on Turkish soil. As Turkey faces its domestic demons, critics say the government has been emboldened to target its enemies within the country because the European Union and NATO allies, in particular, have looked the other way as they seek Turkey’s support to contain the refugee crisis and pacify the raging civil war in Syria. Always thin-skinned, Mr. Erdogan has taken increasingly harsh steps in recent years to muzzle his critics. Dozens of journalists perceived as critical of the government have lost their jobs as officials have put pressure on their bosses. Academics have been targeted for speaking out against the government’s military campaign against Kurdish insurgents in the southeast. At the same time, the justice system has charged Turks of all stripes — authors, journalists, cartoonists, politicians and ordinary citizens — with “insulting the president.” All told, more than 1,800 insult cases have been brought, the country’s justice minister revealed this week. In some cases, such as with Zaman, and a broader crackdown on Mr. Gulen’s followers in business and the judiciary and the police, the government has applied the country’s antiterrorism laws. When Mr. Erdogan’s Justice and Development Party, known by its Turkish initials A.K.P., rose to power in 2002, one of its important allies was Mr. Gulen, a powerful, moderate cleric. The A.K.P. and Mr. Gulen’s followers in the police and judiciary cooperated in a series of trials against military officers on coup charges — later determined to be based on fabricated evidence — that ultimately removed the military’s influence over politics. But in late 2013, the groups had a falling-out over a number of issues, including the government’s handling of protests in the summer of 2013 and Turkey’s aggressive policy of supporting rebels in the Syrian civil war. Another point of friction was the growing hostility between Turkey and Israel, a country that the Gulenists were more sympathetic to than was Mr. Erdogan. At the end of 2013, a corruption inquiry targeted Mr. Erdogan and his inner circle, a challenge that Mr. Erdogan survived by removing police officers and judges. Since then, the two sides have waged an all-out war in which Mr. Erdogan has had the upper hand. The Gulen movement has been on the defensive, accused of being a terrorist organization that is plotting a coup. Its members have been subject to arrests, intimidation and court cases, while Mr. Erdogan has seemingly become more powerful. He has risen to the presidency, while his party, in national elections in November, secured four more years in power. Recently, there was one glimmer of hope for Turkey’s beleaguered journalists. Turkey’s highest court issued a ruling that freed two newspaper editors who were jailed on espionage charges. The editors, Can Dundar and Erdem Gul, of the daily Cumhuriyet, are being prosecuted for reporting on alleged weapons transfers by Turkish intelligence agents to rebels in Syria. The case is proceeding, but the editors were released from jail after the court determined that their constitutional rights had been violated. Mr. Erdogan responded to that court ruling by saying that he did not respect it, and throughout the crackdown on Gulen-affiliated media — which did not begin with Friday’s seizure of Zaman, but has been continuing — government officials have framed it not as an assault on freedom of the press but as a determined effort to destroy a group it sees as an enemy of the Turkish state. Safak Timur reported from Istanbul, and Tim Arango from Beirut, Lebanon. A version of this article appears in print on March 5, 2016, on page A9 of the New York edition with the headline: Turkey Seizes Newspaper as Crackdown on Press and Critics Continues. You really can’t begin to understand conflicts in the Middle East without this specific issue — Oil. See my previous posts about the Caspian Sea. 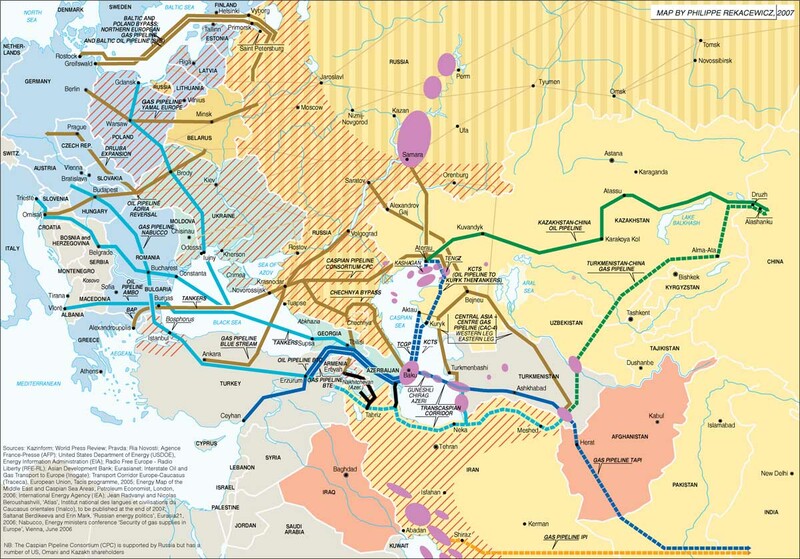 Davutoglu describes the Trans Anatolian Natural Gas Pipeline as a peace project connecting Caucasus to Balkans. The Trans Anatolian Natural Gas Pipeline, TANAP – a pipeline that will transport gas from Azerbaijan’s Shah Deniz field to Europe through Turkey – will be a dream come true, Turkey’s Prime Minister Ahmet Davutoglu said Thursday ahead of his official visit to Azerbaijan. Following Davutoglu’s upcoming talks on Friday on bilateral relations and regional and international developments with Azerbaijani officials, the TANAP project foundations will be laid Saturday which Davutoglu described as a ‘peace project’ that will connect the Caucasus with the Balkans. An estimated 6 billion cubic meters of gas will be delivered to Turkey and 10 billion cubic meters to Europe via the TANAP pipeline which is projected to be opened in 2018 and in which Turkey has a 30 percent share in the project. Turkey’s Minister of Energy and Natural Resources Taner Yildiz and Azerbaijan’s Minister of Industry and Energy Natig Aliyev signed the memorandum of understanding on the TANAP on 26 May, 2014. Turkey signed two significant energy agreements at the end of 2011. 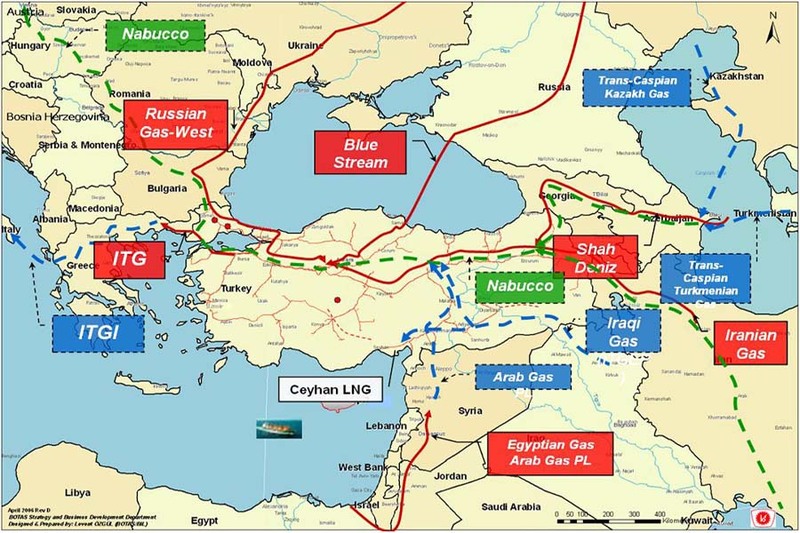 As a consequence, these accords set off a new competition for natural gas-centered energy projects around Turkey. Russia, Azerbaijan, Ukraine, Iran and the European Union are the main actors in this contest. This paper aims to assess all the related and ensuing developments in the Black Sea Region through the lenses of Turkey’s role, strategy and priorities…. 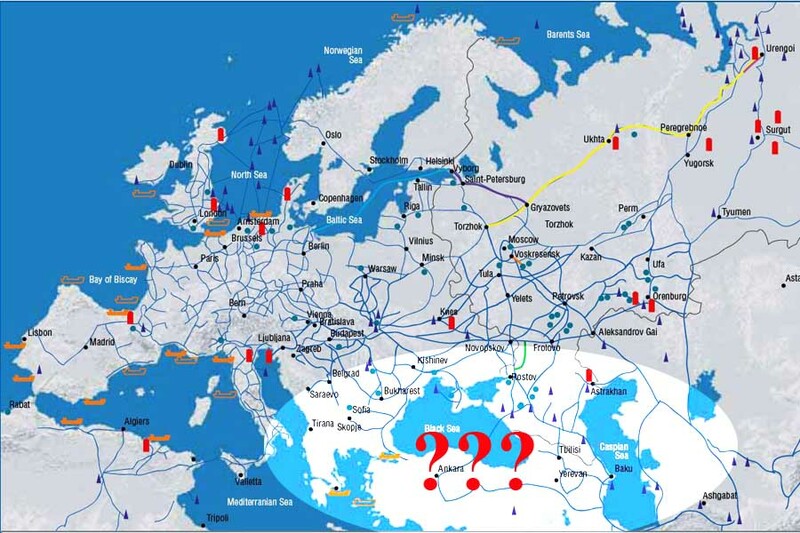 In sum, the Turkey-centric energy game in the region embracing the Black Sea, the Caspian Sea, the Middle East and Europe is reminiscent of the 2004- 2008 period, during which energy prices and the competition for constructing alternative pipelines peaked. Ever since August 10, 2014 when the former Prime Minister was elected President of Turkey I have been more interested in the history and politics of Recep Tayyip Erdoğan (pronounced ray’-chep tay’-ipp err’-do-wan). The Turkish leader intends to enhance the powers of the presidency, which he could hold until 2023. Recep Tayyip Erdogan is arguably the most successful leader in Turkey’s democratic history. After 11 years as prime minister, he will now become his country’s first directly-elected president, in what has been until now a largely ceremonial role. But critics have increasingly accused the 60-year-old leader of polarising the country – by brooking no dissent and harboring a secret agenda to turn Turkey into a religious society. He has dominated the political landscape since 2002, steering his Islamist-leaning Justice and Development (AK) Party party to three general election victories. 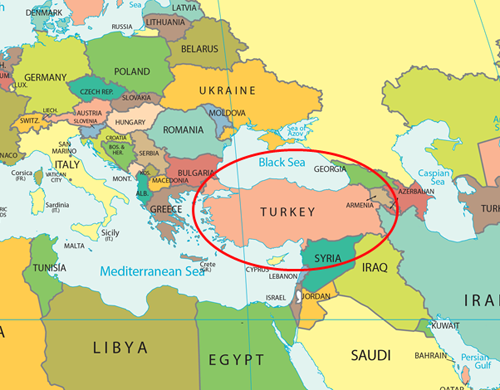 Have Plans For The Antichrist Confederacy Just Been Announced In Turkey? 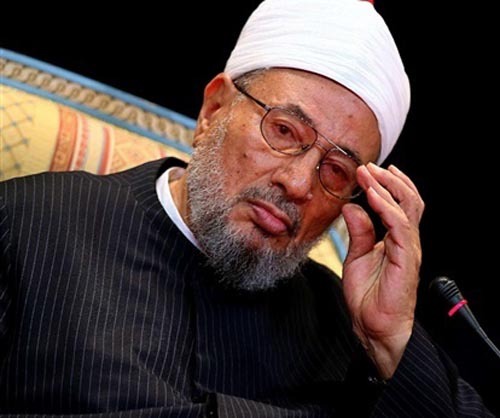 By this, the Muslim union of scholars lead by Qaradawi is setting up the theological precedence by announcing that a future confederacy of Muslim nations must and will be established and centered in the land of the Muslim Caliphate in Turkey. What Qaradawi is speaking of should be seriously noted since the interpretation of the prophecy of a future confederacy of ten-nations is found in four major passages of Scripture and is a determinative issue in any system of prophetic interpretation and are the key to the total prophetic outlook regarding this emerging Antichrist confederacy of different states mentioned in at least four major Scripture passages (Dan 2:31-35, 40-45; 7:7-8, 19-24; Rev 13:1-2; 17:3, 7, 12-16). These passages either directly or by implication prophesy a ten-kingdom confederation, which will be an important aspect of the end-time political situation. What we see here is the beginning embryo and birth of a grand idea set by between Erdogan and the spiritual head of the Sunni Muslim world in which its declared that such confederacy for the Caliphate will be established in Istanbul, Turkey as the center for all these different states…..
Social media activists circulated a video of Sheikh Yusuf Al-Qaradawi, head of the International Union of Muslim Scholars, calling for supporting Recep Tayyib Erdogan in the last presidential elections which Erdogan recently won. I’ll definitely be keeping an eye on activities and developments coming out of Turkey in the days ahead. 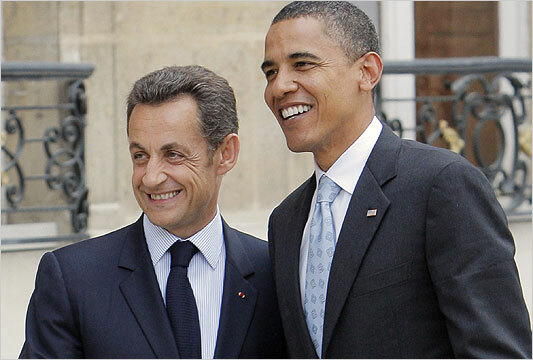 The Obama and Sarkozy administrations are working together on a plan to convene an Israel-Palestinian peace summit in Paris on Sept. 2 shortly after the Libyan war is brought to a close, Debkafile’s Washington and Paris exclusive sources disclose. If they can pull it off, Presidents Barack Obama and Nicolas Sarkozy will join Prime Minister Benjamin Netanyahu and Palestinian leader Mahmoud Abbas at a summit in the French capital to announce the restart of Israel-Palestinian peace talks, thereby calling off the unilateral Palestinian request for UN recognition of an independent state. President Obama’s Special Adviser Dennis Ross and senior French diplomat Jean-David Levitte are leading the effort to get this summit off the ground. According to the US-French plan, it will take place shortly after the Libyan war is brought to a close – ideally by a four-way accord between the US, France, Muammar Qaddafi and the Libyan rebels or, failing agreement, by a crushing NATO military blow in which the United States will also take part. The proposed accord would be based on Muammar Qaddafi’s departure and the establishment of a power-sharing transitional administration in Tripoli between the incumbent government and rebel leaders. The US and French presidents hope to be credited at home and in the Middle East with a triple feat: two diplomatic breakthroughs in the Middle East and a US-French victory in Libya. To this end, negotiations are going forward with the concerned parties. Russia and the African Union have been drawn into the drive to end the war in Libya. One stumbling block still remaining is Qaddafi’s demand for his sons to be part of the proposed transitional administration in Tripoli. To clear the way for the Paris summit, Ross recently put before Netanyahu Obama’s revised formula for the starting-point of negotiations with the Palestinians: Israel would accept the 1967 borders with territorial swaps in exchange for Palestinian recognition of Israel as the national state of the Jewish people. Just this week, the Israeli prime minister said that if the Palestinians recognized Israel as the Jewish homeland, the other outstanding issues could be easily and quickly resolved. However, it is not clear whether the revised formula had won prior Palestinian approval before it was presented in Jerusalem or Washington intended to later squeeze this concession out of Mahmud Abbas and so drive a crack in the deadlock which has frozen the peace track for more than seven months. At all events, Netanyahu’s reply was qualified. He accepted the new US formula in principle, but batted the ball back into the White House’s court. Debkafile’s sources in Jerusalem and Washington disclose that he made acceptance contingent on President Obama publicly and formally affixing his signature to President Bush’s letter of April 2004 to then-Prime Minister Ariel Sharon. This letter constituted a presidential commitment to support negotiations with the Palestinians based on UN Resolution 242 (which promised Israel defensible borders), to refrain from demanding Israel’s return to the 1949 lines, and to acknowledge the existence of major Jewish population centers on the West Bank as demographic changes occurring in the years since the Six-Day War. The prime minister is now waiting for an answer from the White House. Our sources in Jerusalem explain that this exchange encapsulates the US-Israeli-Palestinian debate over how much territory the land swaps would leave Israel and the Palestinians respectively in future agreements on their borders. Up until now, the Palestinians have insisted on a ratio of one kilometer in pre-1967 Israel for every kilometer awarded Israel on the West Bank. This ratio Jerusalem has found to be unacceptable. A comprehensive study commissioned by the prime minister’s office from the National Security Council found that the big settlement blocs on the West Bank cover roughly 8 percent of West Bank area. Giving up an equal area of Israeli territory would imperil its security no less than a flat return to the 1967 borders. Israel cannot therefore afford to cede more than 4 percent of its sovereign territory at most. The Palestinian demand for parity in the mutual exchanges of land is therefore rejected by Jerusalem. Jerusalem is reverting to the Bush letter and its reaffirmation of UN Resolution 242 – not just because it better addresses Israel’s security needs more advantageous, but also because, “You can’t just toss out UN Resolution 242 and Bush’s letter to Sharon,” Netanyahu has been saying in recent private talks. In his view, the Obama White House cannot simply ignore a presidential commitment given by his predecessor personally to an Israeli prime minister. In the opinion of the prime minister and his advisers, the formula incorporated in Obama’s May 19 speech requiring Israel to return to the 1967 borders with mutual land swaps and accept a non-demilitarized Palestinian state is tantamount to giving up on secure borders. The UN 242 and the Bush commitment upheld this principle and is therefore the option preferred in Jerusalem. LISBON/DUBLIN (Reuters) – The euro zone’s debt crisis deepened on Tuesday, with investors pushing the risk premium on Spanish and Italian government bonds to euro lifetime highs amid concern weaker member states may ultimately be forced to default. 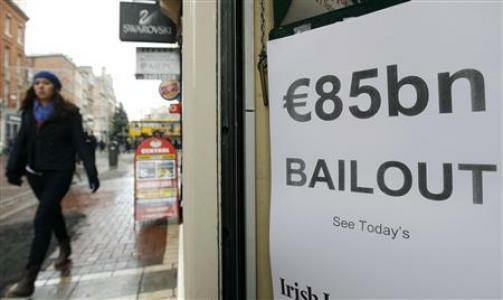 European policymakers appeared at a loss to calm markets hell-bent on testing their determination to rescue countries like Portugal and Spain after approving an 85 billion euro ($110.7 billion) bailout for Ireland at the weekend. The borrowing costs of countries like Belgium and France also rose — and the euro hit a 2-1/2 month low versus the dollar — as investors looked beyond the so-called euro periphery and targeted core founding members of the bloc. A Reuters survey of 55 leading fund management houses showed U.S. and UK investors had significantly cut back their exposure to euro zone bonds this month, piling into equities instead despite a weakening in global shares. Markets are already discounting an eventual rescue of Portugal although the government in Lisbon denies, as Irish leaders initially did, that the country needs outside aid. While a Portuguese rescue would be manageable, assistance for its larger neighbor Spain would sorely test EU resources, raise deeper questions about the integrity of the 12-year old currency area, and possibly spread contagion beyond Europe. Citigroup Chief Economist Willem Buiter described the turbulence hitting the euro zone as an “opening act” and predicted that sovereign default fears could soon extend to Japan and the United States. “There is no such thing as an absolutely safe sovereign,” he wrote in a research note. The euro fell as low as $1.2969 and has shed nearly 8 percent of its value against the dollar this month. The yield spreads of 10-year Spanish, Italian and Belgian bonds over German benchmarks spiked to their highest levels since the birth of the euro in January 1999 and the cost of protecting against a euro zone sovereign default surged. Jitters also hit European banking shares, which fell 1.2 percent, led lower by French banks BNP Paribas, Societe Generale and Credit Agricole on market rumors Standard & Poor’s might cut France’s outlook. “There is no reason for concern, no risk,” said Francois Baroin, France’s budget minister and government spokesman. The eurozone, officially the euro area, is an economic and monetary union (EMU) of 16 European Union (EU) member states which have adopted the euro currency as their sole legal tender. It currently consists of Austria, Belgium, Cyprus, Finland, France, Germany, Greece, Ireland, Italy, Luxembourg, Malta, the Netherlands, Portugal, Slovakia, Slovenia and Spain. Eight (not including Sweden, which has a de facto opt out) other states are obliged to join the zone once they fulfill the strict entry criteria.